The sanctuary has provided a peaceful place for retirement to 27 elephants so far. 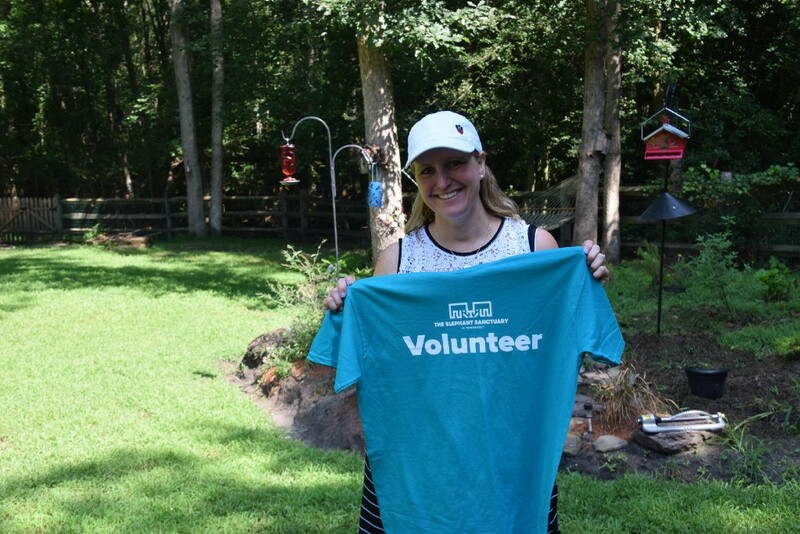 Colleen Rossi is pictured at her Shamong residence with the volunteer shirt from her trip to the Elephant Sanctuary in Tennessee. Shamong resident Colleen Rossi has found a safe haven of her own within the Elephant Sanctuary in Hohenwald, Tenn. The fourth-grade teacher at Osage Elementary School in Voorhees has been taking students on virtual field trips to the sanctuary for approximately 20 years. These virtual field trips consist of talks with Todd Montgomery, the sanctuary’s education coordinator, in which students are provided with information on the sanctuary, along with information on each of the ten elephants that reside there. The sanctuary was founded in 1995 by Carol Buckley and Scott Blais, who wanted to give Tarra, a former circus performing elephant, a place to safely live out the rest of her life. The sanctuary has since taken in a total of 27 retired elephants from circuses and zoos, giving them space to finally live freely after spending their lives in captivity. For this reason, no visitors are allowed at the sanctuary. Many of the elephants at the sanctuary suffer from long term health and behavioral issues, requiring a team of veterinarians to provide care for each of the elephants. The nonprofit provides a home for three African elephants and seven Asian elephants, requiring different habitat space for the two species. Currently, all of the elephants at the sanctuary are female. The sanctuary’s website states that this is because female elephants in captivity outnumber males, male elephants in captivity have very different needs for individualized care and elephant herds are lead by an older female. Therefore, when a male reaches maturity, he leaves the herd. Rossi, along with her husband were recently selected as two of 10 volunteers that were granted access to the sanctuary grounds. Rossi stated that she was filled with excitement when she was notified about the selection and that she ran from room to room of the elementary school sharing the once-in-a-lifetime news. The Shamong residents packed their bags and set out on the one-day volunteer trip, held on Aug. 4. Staring at 8 a.m., they dug right into working — partaking in the maintenance of landscaping, preparing bamboo treats for the elephants, cutting banana leaves and cutting honeysuckle off of fences to preserve their durability. To the couple’s surprise, they caught a glimpse of seven of the 10 elephants that have retired on the more than 2,700 acre land. “The first elephants I saw were two African ones, Tange and Sukari, it just brought me to tears,” Colleen said. 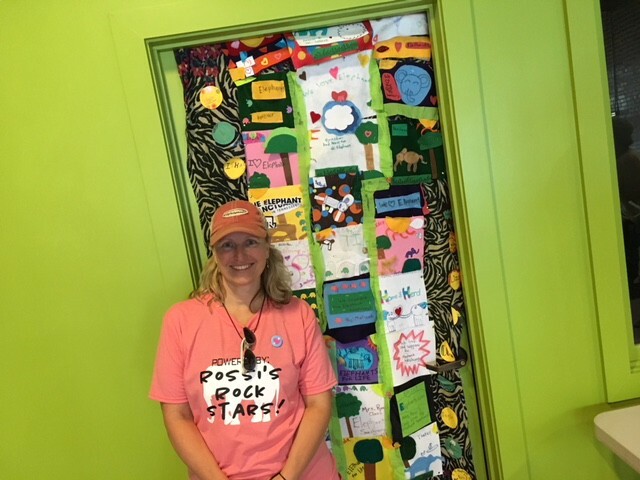 Colleen Rossi at the Elephant Discovery Center at the Elephant Sanctuary in Tennessee on Aug. 4., with the quilt her fourth-grade students made. They were able to visit the African and Asian sanctuary grounds and leave stones at the graves of elephants that have passed. Rossi was also able to hang a quilt made by her students in the Elephant Discovery Center. “There are such kind hearted, good people that care about giving these elephants a place to live out the rest of their lives in peace,” Rossi said. To learn more, to donate, or to watch the elephant live stream, visit www.elephants.com.